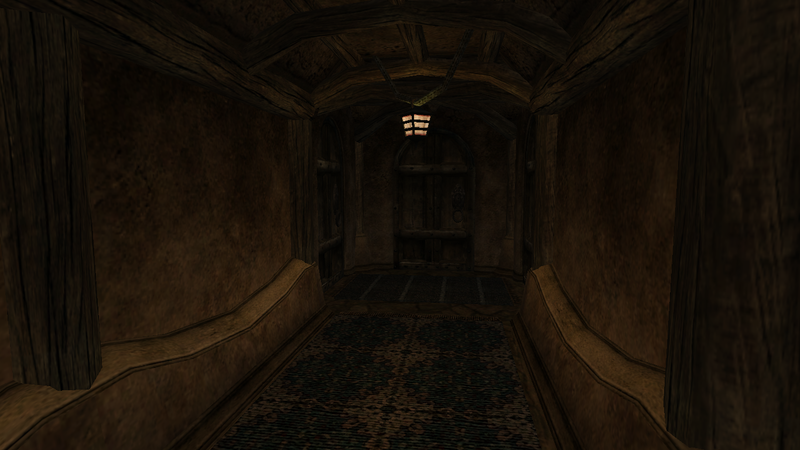 Yeah, wanted to contribute a little more to the projects, so I decided to try my hand at interiors. Maybe I can do some of more menial tasks for awhile. 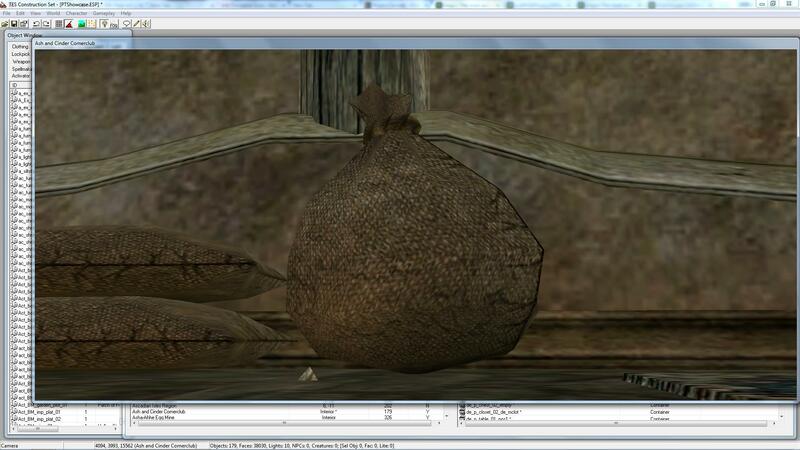 I am not very experienced with modding Morrowind so far, but I've had some experience + Oblivion modding experience. 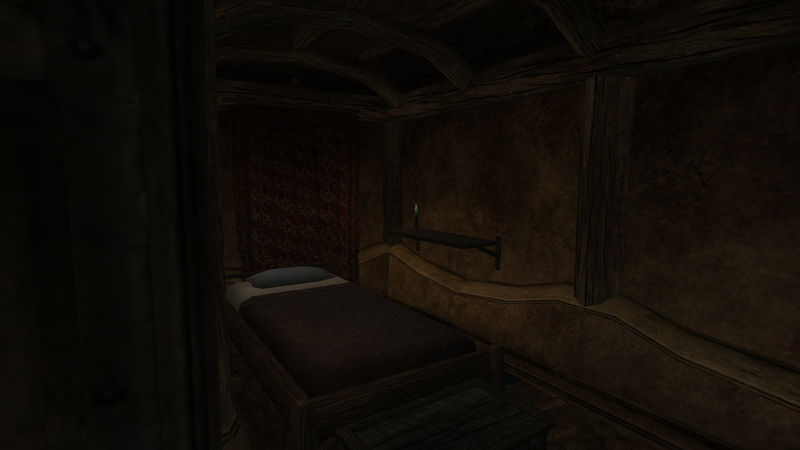 This is actually first interior I properly built from scratch in Morrowind. Nothing too fancy, but I think it looks okay. I hope I haven't screwed anything up. I used many tapestries and rugs, but I am not sure if they are region specific or not. If they are, it's not too good I guess. 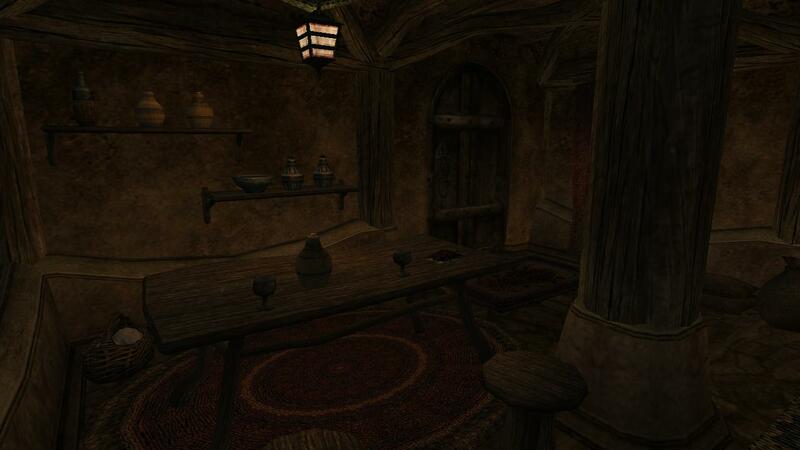 The interior is for Hlaalu house "ex_hlaalu_b_05" and it features a relatively small and cheap cornerclub, utilizing de_p furniture. I tried to rotate a few things, looks easy enough, but I did not go out of my way to rotate every single thing. The club is called Ash and Cinder Cornerclub and I even made up a small story about it. My thought was that it's primarily not a cornerclub, but a brothel where young girls from ashlanders' tribes end up working after they leave their community. You will see that even though it's a cornerclub, there are several rooms downstairs for that purpose. 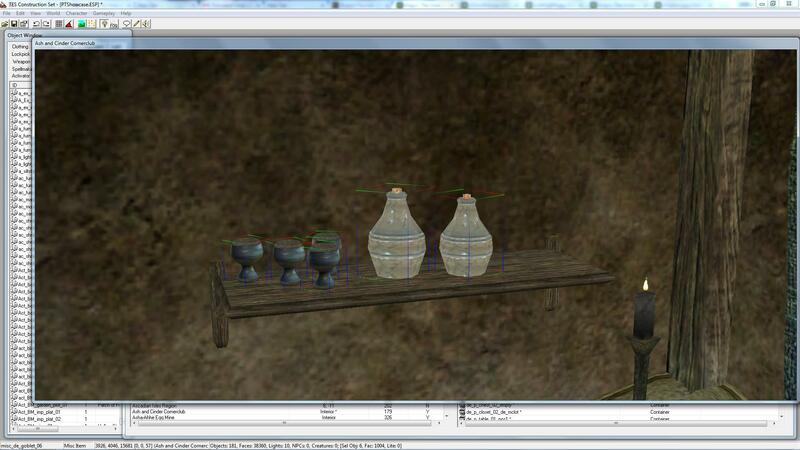 Don't be afraid to add rotation and scaling to your objects -- the fallen bottle on the bottom shelf is nice, but you can add more rotation on some of the cups etc. 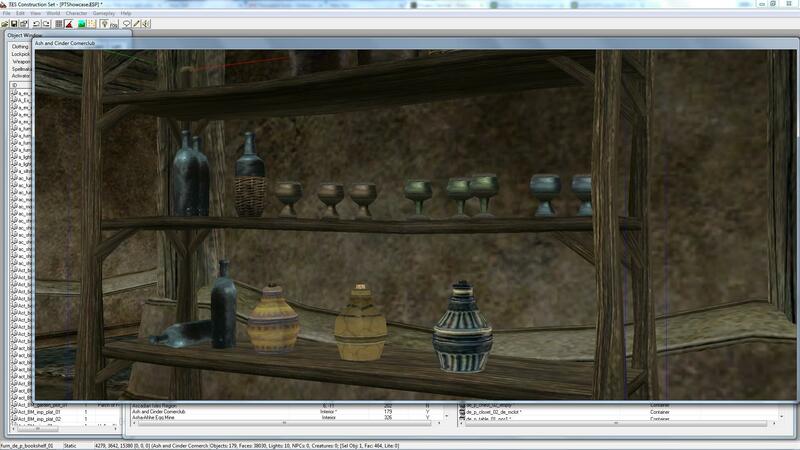 Shelves like this can look like this if you add scaling, which is more objects and more interest for little effort. The only other thing I would say is to add some more references, to get it over the 200 mark. Clothing, jewellery, gold, minor potions, books, misc items are all there for you to use! Some plates maybe? Overall a lovely interior for your first effort! 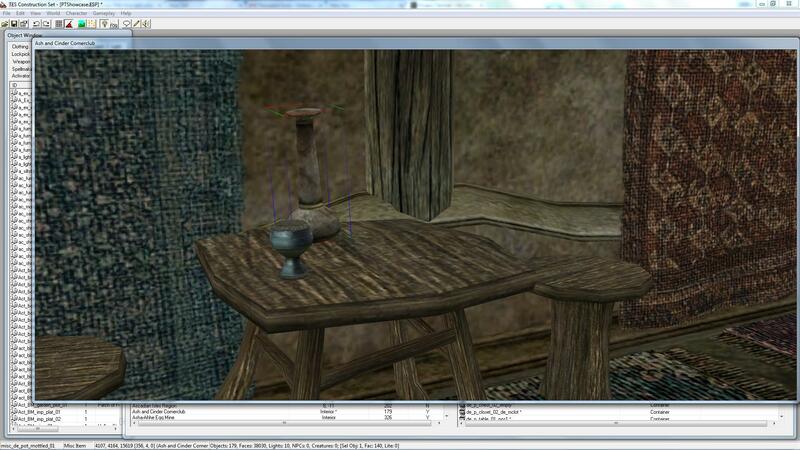 Great use of lighting, and rotation of objects like on this table shows you know how to do it! "furn_de_rope1_01" bleeding through floor upper level. "com_sack_02_chpfood3" need to bleed through the ground a bit. "com_sack_01_chpfood5" need to bleed through the lower sack a bit. "Gold_025" need to be rotated. "misc_com_bottle_06" bleeding through the shelf. "Potion_Local_Brew_01" need to be rotated. 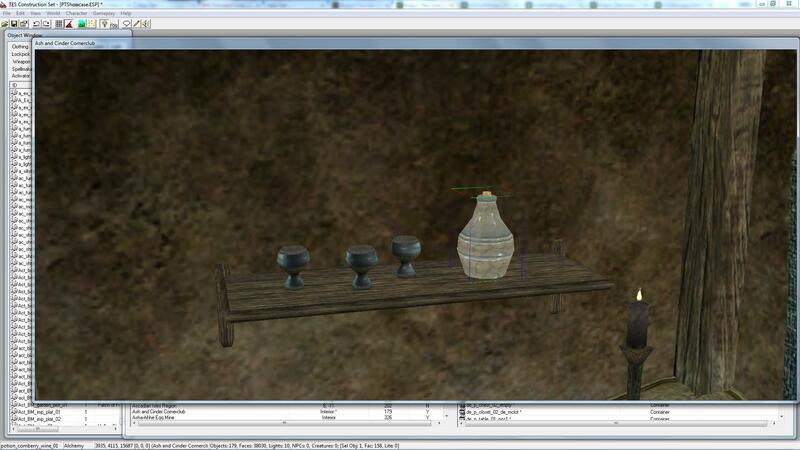 "potion_local_liquor_01" need to be more rotated. "misc_de_goblet_05" X3 floating, need to be rotated. "misc_de_goblet_07" X3 floating, need to be rotated. "misc_de_goblet_06" X3 floating, need to be rotated. "misc_com_bottle_15" X2 need to be rotated. - There is no counter/bar where you can barter food and rent a bed. - There are only stools and a couple of benches, replacing some stools with chairs would make it more diverse in terms of seating options. 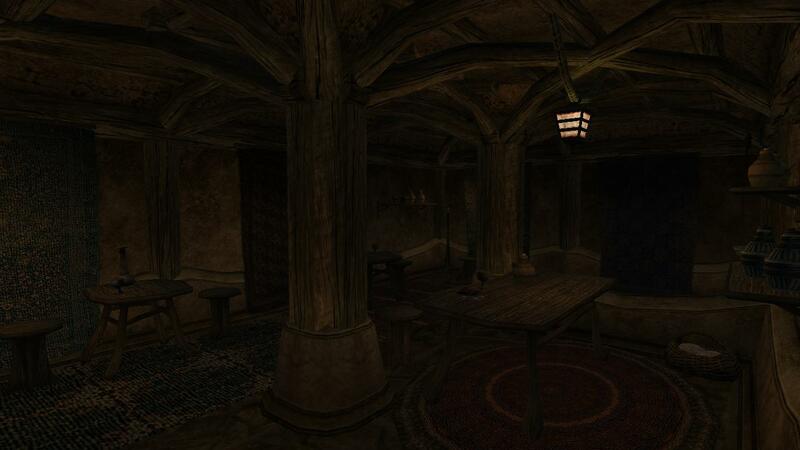 - Since it is a club, therefore a public area, I wouldn't add Skooma and a Skooma Pipe in one of the rooms. Especially if the room isn't locked, which it isn't. 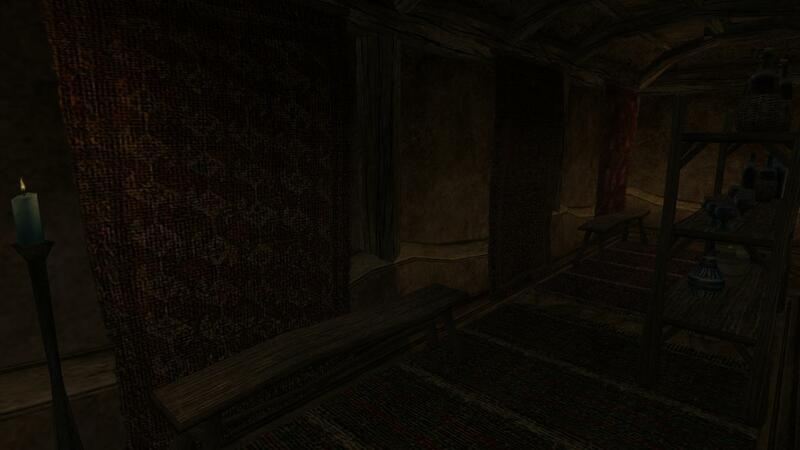 - Interior is way too dark, houses, taverns, inn's ect. 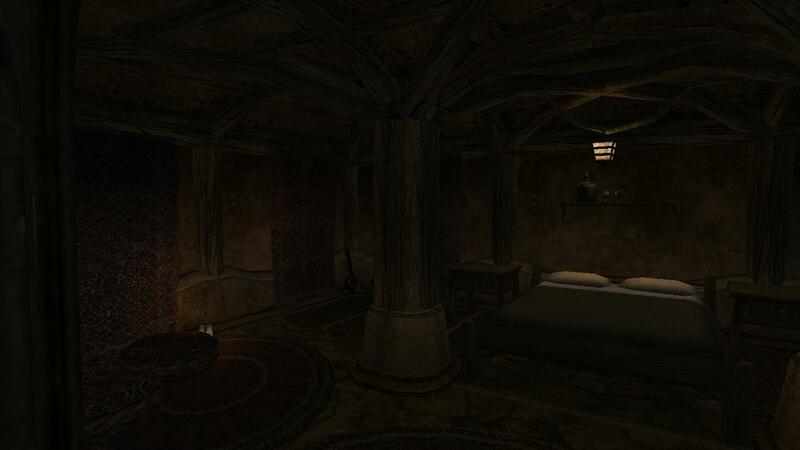 are lighter in terms of lighting than caves or ruins, you could actually look up one of the houses in Balmora and copy the lighting settings into your interior. Also, you don't want players to be able to sleep on the ground, therefore the box "Illegal To Sleep Here" must be set to; "Yes". In some areas of the Pathgrid are very narrow, like next to a bed for example. It's actually better to give the pathgrid more space than it is now. The Granularity of the pathgrid can be set to 512. The current one 1024 is a bit extreme in this interior. Don't forget to add a Northmarker next time. Fix these issues that were mentioned above and we'll see what will happen next. Thank you both, guys, for the constructive criticism . I expected a few mistakes on my part, just because of the lack of experience. Yeah, stuff like North Marker and Illegal to Sleep completely slipped through my mind. I will try fixing all of the issues you've pointed out and will upload a fixed version today. How about now? I think I fixed most of it, hopefully all of it. Added a publican, just to show where exactly I planned for him to be. Yes, he is supposed to be a Camonna Tong, just like this whole brothel aka cornerclub. Locked the door on the first floor. Slightly changed pathgrid, added North Marker, added a bit more clutter, etc. I did not add ownership though, but I know how to do it if it's needed. What do you think? There are some issues that are not yet fixed, but you fixed most of them and those remaining issues can be easily fixed later in the review process if this were an actual claim. Advice: Please take your time when you place an object or just rotating in general, look at the object from every angle to make sure that it lies properly within it´s place.